It’s that time of the year…twice a year during quilt market, Amy @Amy’s Creative Side hosts a Blogger’s Quilt Festival. If you have stopped by my blog for the first time from the quilt festival, thank you! We are allowed to link up two quilts to the various categories and have the opportunity to visit and be inspired by other blogger’s wonderful quilts. I was so excited to be highlighted in January in one of Amy’s Blogger’s Quilt Festival Features. Yesterday, I highlighted my Triangle Transparency quilt for the Original Design category. 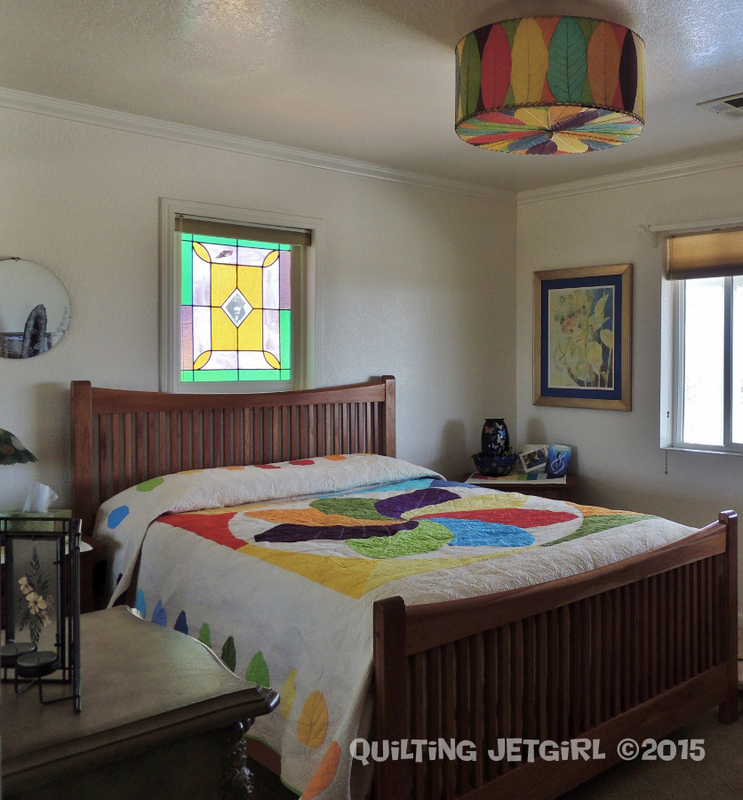 I was commissioned to make an oversized queen quilt based on the unique light fixture in my customer’s bedroom: a dried and died cocoa leaf drum lamp. My initial design sketch for the queen size quilt was hand drawn, but I was pulled toward making the center medallion out of large leaf shapes immediately. At about the same time as the design was evolving, I was learning to use Electric Quilt (version 5). I was never able to fully get EQ5 to represent the center medallion the way my customers and I envisioned it, but it was a great tool for fine tuning nuances like the size, orientation, and color for the bordering cocoa leaves. I took my Kona color card into the room with the lamp on a day with great natural light, and we color matched to the lamp. The background and backing of the quilt are Kona Cream. Taking my time to coordinate with my customers along the way was really beneficial for this quilt. Taking a look at how I had originally planned to sew down the center medallion side by side with the finished center helps point out a few of the great changes that were made. The leaves at 4:30 and 7:30 were swapped to achieve a better color balance. And while I had been focusing on the layering and multi-color effect that stacking the fabrics could achieve, my clients intuitively arranged the leaves in a consistent overlapping sequence that creates a beautiful spiral. 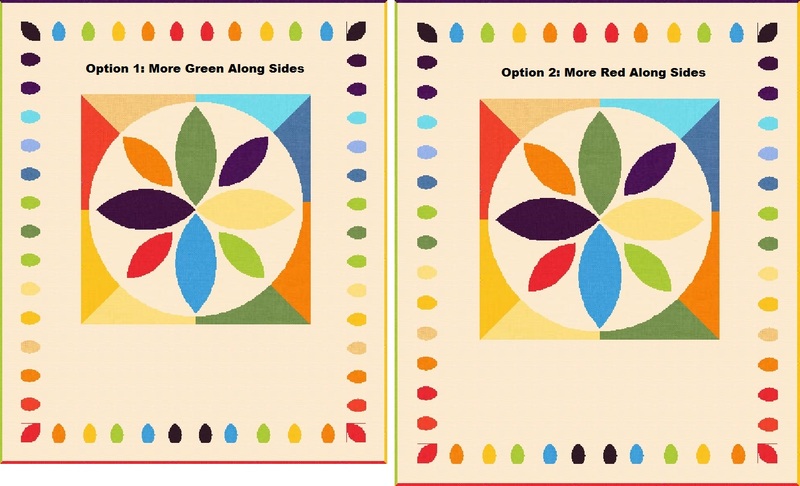 I used my quilt pattern questionnaire to discuss the quilting options with my customers, and they wanted an intricate, one-of-a-kind, unique, organic, curvy, and free form design. I knew my inspiration for quilting the center cocoa leaves was going to be the veining of the actual leaves themselves, but other than that I had pretty free reign to play. 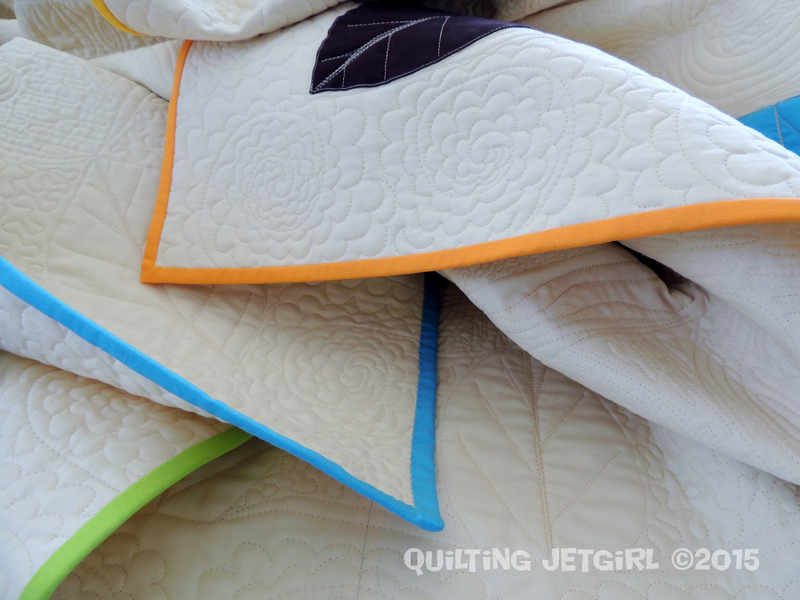 Note that the majority of the quilting was done on my APQS Millennium longarm machine, but I did some finishing work on my Bernina 820 as well. My longarm has a 10 foot frame and this quilt just *barely* fit! 50wt Aurifil 2000 (light sand) blended in perfectly with the Kona Cream background fabric to create wonderful texture and pops out dramatically on the saturated colors of the medallion and border leaves. I quilted a repeating flower on the border outside of the border cocoa leaves. In between the border leaves I quilted a simple curved meander. 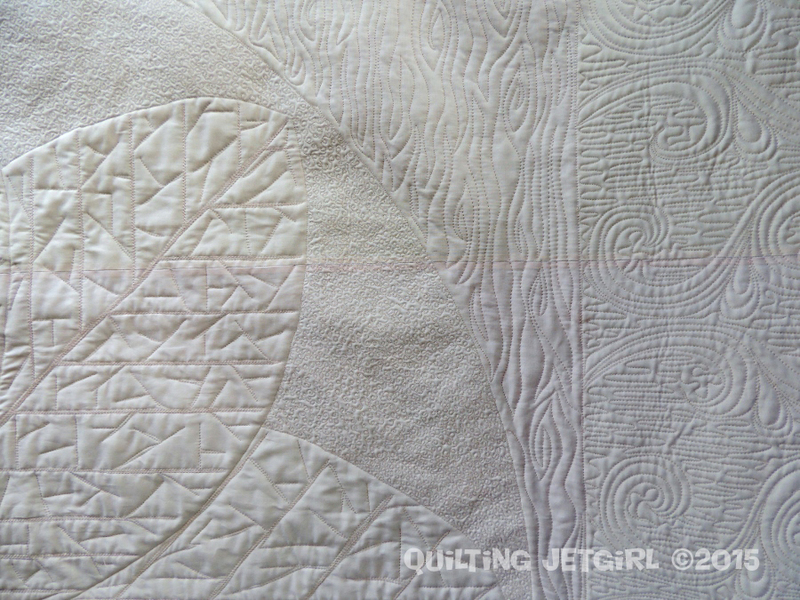 The border leaves themselves are outlined and a quick and I quilted simple vein pattern. In the majority of the negative space on the quilt top, I used Angela Walters’ chain swirl pattern with a fill of back and forth lines. I think the swirls evoke both air and water. On the colored transition between the round center medallion and the square quilt, I quilted a wood grain pattern. 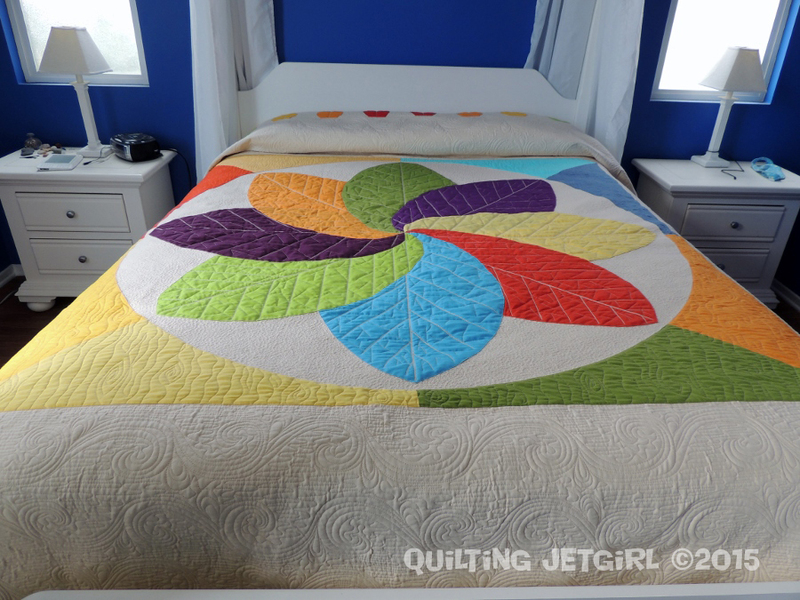 I really want the center cocoa leaf medallion to stand out, so in the negative space around the center medallion leaves I quilted a very small and dense meandering loop. And I tried to add in realistic vein detail for each of the center cocoa leaves. 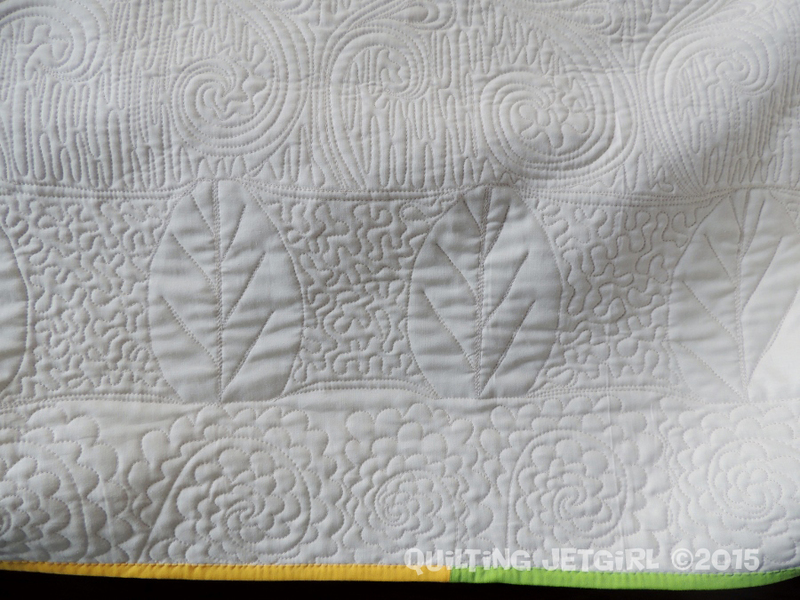 I made the center vein very prominent by quilting repeatedly down the center of each leaf. The subsequent branches of the veins are less and less quilted, and I really like the effect and texture it gives to the center. In the photograph below you can also see how the veins stand out on the back of the quilt. I did all of the quilting free-hand without the aid of a ruler to give a more organic and natural feel. If nature doesn’t make perfectly straight lines, I figured I didn’t need to, either. Speaking of the back of the quilt, I might love the back of this quilt as much as the front. 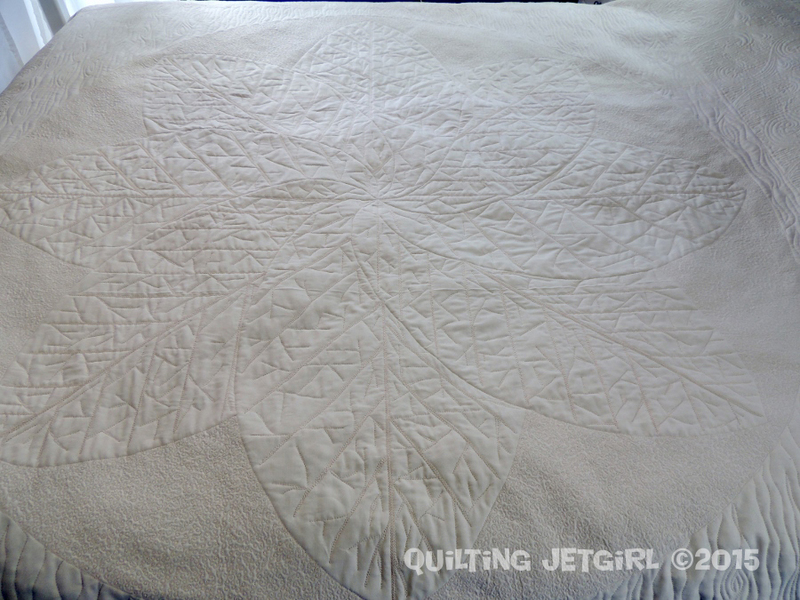 After removing the quilt from my long arm frame, I spent 1.5 hours outlining the cocoa leaves and the center circle with the walking foot on my Bernina 820. If nothing else, it really helps add definition on the back of the quilt! Even from the zoomed in vantage of the photo above, the tiny loop meander fill around the leaves is starting to look like pure texture! The finishing touch for the cocoa leaf medallion quilt is the ROYGBV binding, which I machine stitched down to the front of the quilt and hand stitched down to the backing. For me, there is something so meditative and calm about whip-stitching down binding, and I am glad I took a bit of extra time to hand finish the quilt. The finished quilt weighs 9 pounds! Almost 2.5 miles of thread just in the quilting!!! Beautiful!! I love all the small details too!! Congrats on the big finish! This is a lovely quilt, Y. And it was a joy to watch the process from afar. Yay! LOVE!! Yvonne, it turned out spectacularly! Your quilting design choices are stellar and the execution is flawless! Wow! It was so interesting to see this one come together for you! Well done!! Just stunning, I love it! It is awesome how you were able to get both the huge quilt and the lap shade inspiration in the same picture. This is a finish to be proud of! It turned out gorgeous, gorgeous, gorgeous! 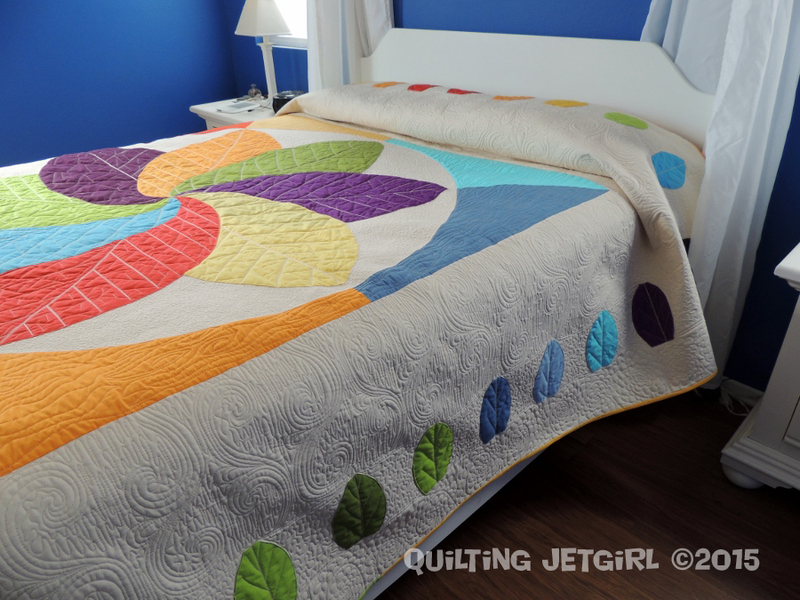 All that quilting…WOW! Beautiful job Yvonne! Amazing! It is an awesome finish. Your customers must be thoroughly pleased. Yvonne, I saw your quilt yesterday and it is absolutely brilliant. Wow! This is just stunning, and looks soooo good with that light shade. What a great interpretation of the inspiration piece. And the quilting is stellar! To-date, this has to be my favorite quilt of yours that I have watched you from beginning to end and there is nothing negative to say about any of it. I love your analogy of nature not making perfect straight lines, so you shouldn’t have to either. Ha! This entire quilt has come from a place of lots of hard work and even when not loving it at moments, still loving it because it is one DAMN AWESOME quilt! This will be one to that will be told for years to come and I bet it will be argued over in the future of ‘who gets it’. Great job, Yvonne! I was reading the intro paragraph and wondering why you said the leaves were both dried and died…dead? Of course they are dead. Why would Yvonne say they were dead? Ohhhhh dyed, hahaha. My brain is in drainage mode from this cold. I love the way the finished quilt looks! Your quilting really added a lot of wonderful texture and detail. Plus the way those center leaves look a bit raised is awesome! It looks amazing, and so perfect for the bedroom, your clients must be incredibly happy (love the use of the minis too!). The quilting is just gorgeous, I think I love the back just as much as the front, so worth all the time you spent on it. It has been such a pleasure to follow your progress on this amazing quilt – from design concept to reality. The finishing touches you provided with the quilting is outstanding. Love those leaves! Such a great big beautiful finish! This is truly an accomplishment. You must (and should be) so pleased! 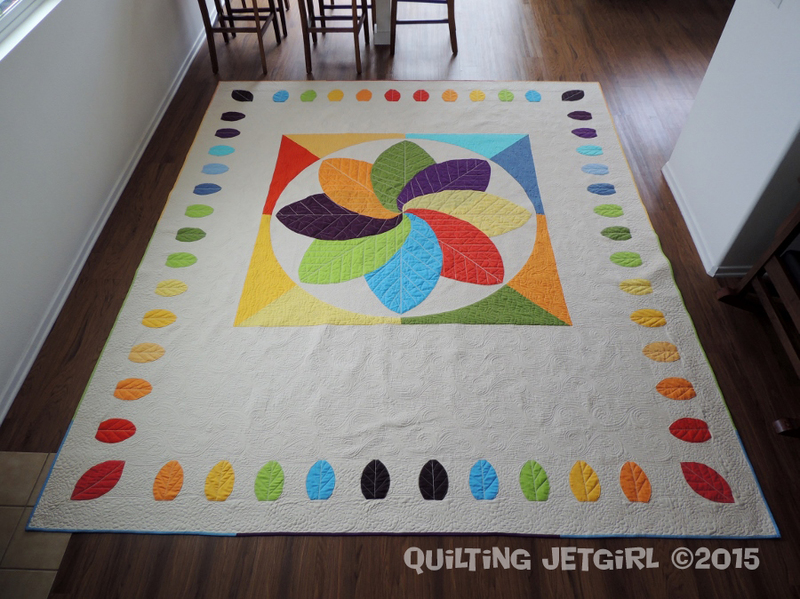 The center medallion is stunning to look at and your quilting is one of a kind. You did excellent design work in matching your customer’s wishes Yvonne! Cocoa Leaf Medallion looks wonderful under the matching light. I am in awe of the quilting you did – especially along the sides. Magnificent! This is definitely my favorite finish of yours. It’s such an amazing piece of art and is truly an heirloom that will be treasured. What a beautiful, completely custom quilt. You did such an amazing job. I loved watching your process. I’m sure they are thrilled. It looks so beautiful in their home. 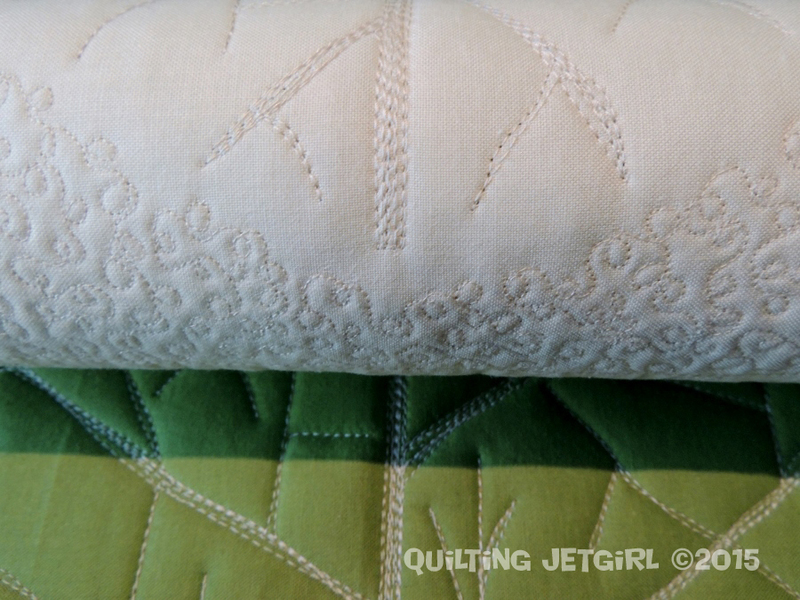 Stitching down around the leaves really did enhance the quilting and how it lays. Thank you so much for sharing. This quilt turned out so rich! 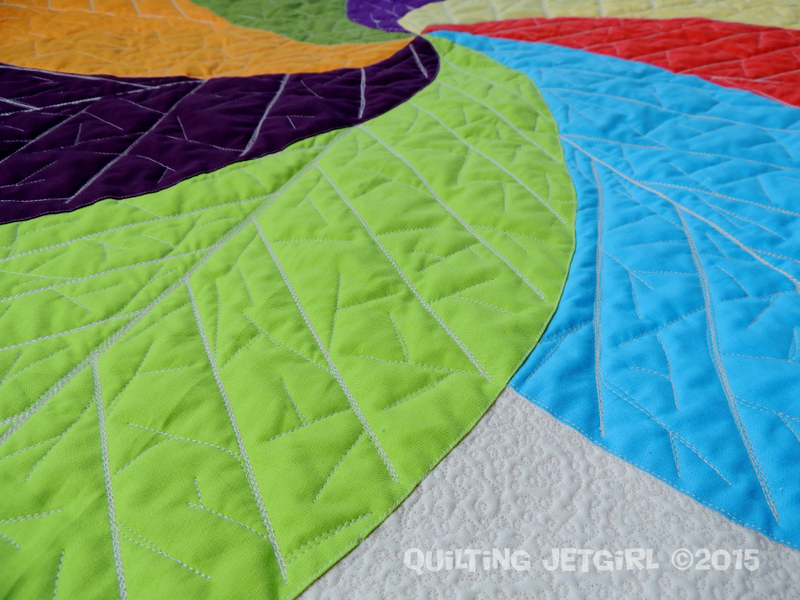 I love the way the leaves stand out against the textured quilting. It looks amazing on both your bed and in your clients’ room. Congrats on getting it finished in time for the Blogger’s Quilt Festival! Yvonne, your quilting on this is amazing! I love all the textures and shapes you have got in there, especially the swirly bits (that’s a technical term). This is one amazing quilt. The quilting is stunning. Love the colours and the leaves are great. This will be a cherished quilt. Wow! That is one beautiful quilt! Thanks so much for taking the time to post about your process- I find that so interesting. This is so so beautiful. 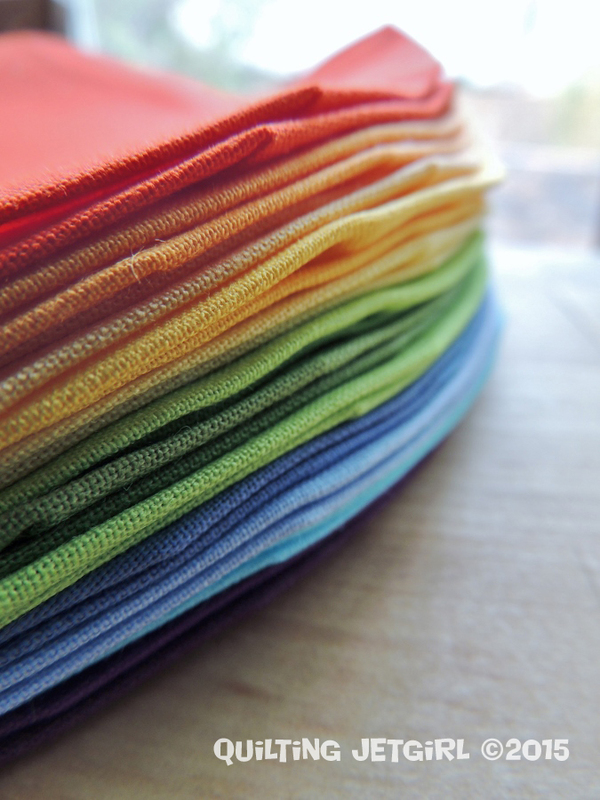 I just can’t get over your amazing quilting! Every time I see this quilt, in every stage, i am blown away. It is simply amazing. Gorgeous quilting – this turned out so well and so much work and thought – its all well worthwhile! Stunning, amazing, whoop whoop! I VOTED FOR YOUR QUILT! It’s really quite a fabulous piece. I’m completely in love with it! It’s fun to read about the process too. The creating/idea phase is one of my favorites…Thanks so much for sharing. Awesome job. Wow. That is an impressive quilt, in the size, the design and the quilting. Beautiful work! Hi Yvonne, this is fantastic! I love the quilting details. It looks amazing on the front and back, I especially like how you quilted the leaves – the veins are very cool! Fabulous finish! You done so well on this quilt! The whole thing, design, colors, quilting. Congrats!